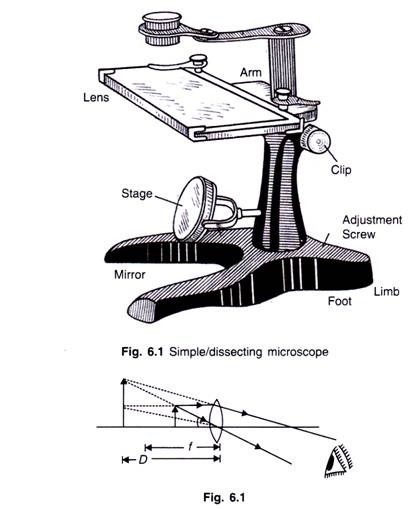 As shown in the figure 6.1, dissecting microscope consists of a biconvex lens which is moved up and down by an adjustment screw to bring the object in sharp focus. The object is placed on the platform and light is focused with the help of a concave mirror fitted below. 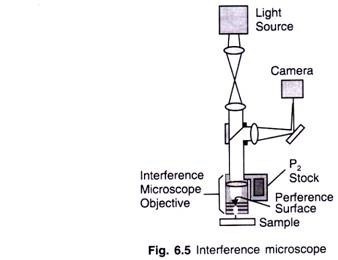 In simple microscope, convex lens of short focal length is used to see magnified image of a small object. The object is placed between the optical centre and the focus of a convex lens, its image is virtual, erect and magnified and on the same side as the object. The position of the object is so adjusted that the image is formed at the least distance of distinct vision (D). 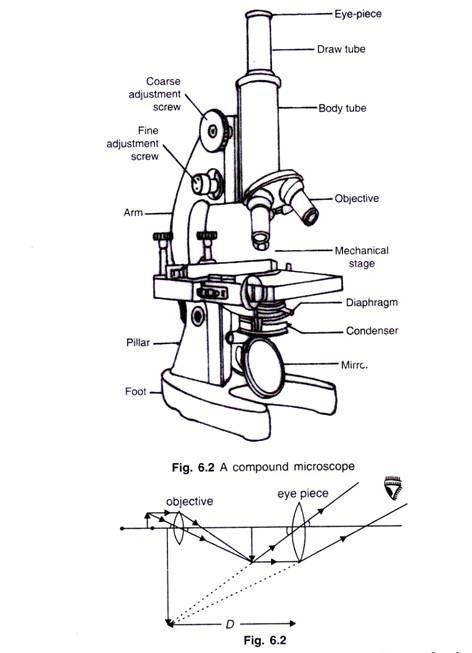 Magnifying power (M) of a simple microscope is the ratio of the angle subtended by the image at the eye to the angle subtended by the object seen directly, when both lie at the least distance of distinct vision or the near point. Where D is the least distance of distinct vision and f is the focal length of the lens. 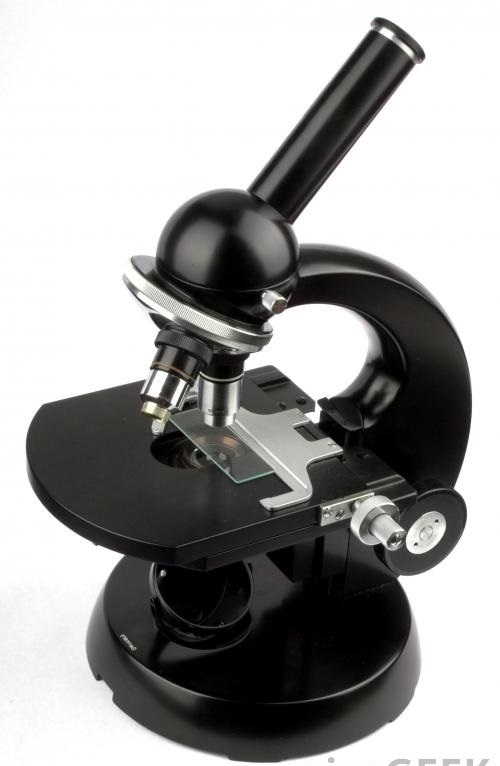 A compound microscope consists of two set of convex lenses. A lens of short aperture and short focal length facing the object is called objective. Another set of lens of relatively moderate focal length and large aperture facing the eye is called the eye piece. The objective and the eye piece are placed coaxially at the two end of a tube (Fig. 6.2). The object is placed between the centre of curvature and focus of the objective – it forms real, inverted and magnified image on the other side of the objective. This image acts as an object for the eye piece which then acts as a simple microscope to produce virtual, erect and magnified image. Where f0and fe are focal length of objective and eye piece respectively, L is the length a the microscope tube and D is the least distance of distinct vision. The organelles of the cell became known after the electron microscope was invented. The electron microscope was developed in 1932 by M. Knoll and Ruska in Germany. It consist of a source of supplying, a beam of electron of uniform velocity, a condenser lens for concentrating the electron on the specimen, a specimen stage for displacing the specimen which transmits the electron beam, an objective lens, a projector lens and a fluorescent screen on which final image is observed (fig. 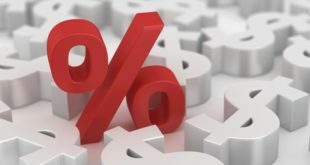 6.3). For permanent record of the image, the fluorescent screen is replaced by photographic film. This microscope utilizes a stream of high speed electrons which are deflected by an electromagnetic field in the same way as a beam of light is reflected when it crosses a glass lens. 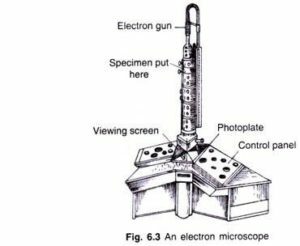 There are two types of electron microscope. This is used to observe fine structure of cells. Ultra thin sections of the object are prepared and they are stained with a heavy metal (gold or palladium) to make certain part dense, and inserted in the vacuum chamber of the microscope. 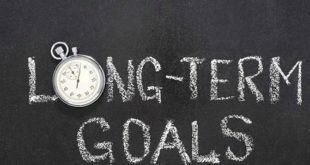 A 100, 00 volt electron beam is focused on the section and manipulated prepared from the image may be enlarged with enough resolution to achieve a total magnification of over 20 million times. 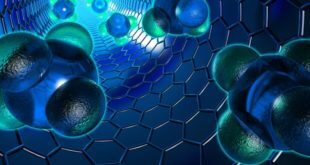 It is used to study the surfaces of the cell and organisms. 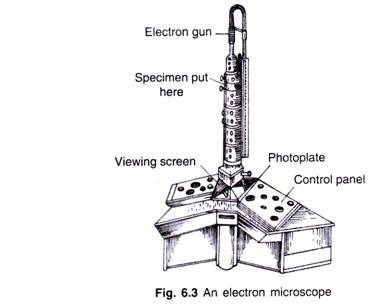 In this microscope, the image is formed by electrons reflected back from the object. The image formed by this microscope has a remarkable three dimensional appearance. Typically magnification of scanning electron microscope is around 20,000 times. This is used to study the behavior of living cells, observe the nuclear and cytoplasmic changes taking place during mitosis and the effect of different chemicals inside the living cells. 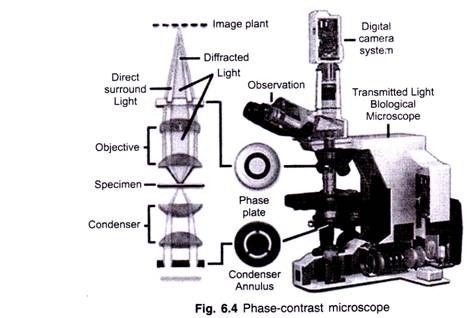 By using the phase-contrast microscope, an image of strong contrast of the object is obtained (fig. 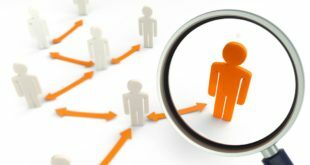 6.4). It is a contrast-enhancing optical technique that can be utilized to produce high-contrast images of transparent specimens, such as living cells (usually in culture), microorganisms, thin tissue slices, fibers, glass fragments, and sub-cellular particles (including nuclei and other organelles). In effect, the phase contrast technique employs an optical mechanism to translate minute variations in phase into corresponding changes in amplitude, which can be visualized as differences in image contrast. One of the major advantages of phase contrast microscopy is that living cells can be examined in their natural state without previously being killed, fixed, and stained. As a result, the dynamics of ongoing biological processes can be observed and recorded in high contrast with sharp clarity of minute specimen detail. Interference microscope is used for quantitative studies of macromolecules of the cell components, for example it is used for determination of lipid, nucleic acids and protein contents of the cell. Interferometry is a traditional technique in which a pattern of bright and dark lines (fringes) result from an optical path difference between a reference and a sample beam. The incoming light is split inside an interferometer, one beam going to an internal reference surface and the other to the sample. After reflection, the beams recombine inside the interferometer, undergoing constructive and destructive interference and producing the light and dark fringe pattern. A precision translation stage and a CCD camera together generate a 3D interferogram of the object that is stored in the computer memory. This 3D interferogram of the object is then transformed by frequency domain analysis into a quantitative 3D image providing surface structure analysis (fig. 6.5). Tags Compound microscope Different types of microscopes Different types of microscopes being used in biological studies Electron microscopes how many types of microscope? Interference microscope Phase-Contrast microscope Simple Microscopes: types of microscope What is Microscope?